Those were the same words that the little servant girl said to Naaman the commander who suffered from leprosy, in II Kings 5. She knew of a man (Elijah) who was so close to God that miracles happened when he was around. I want someone to be able to say of me, “there is a woman” (or a man) don’t you? I want to be so intimate with the Holy Spirit that the atmosphere, the environment around me is changed when I show up. I want people to notice, not me, but God in me. Isn’t that why we are still here? We are supposed to be about our Father’s business, building His Kingdom. No matter what government we sit under, no matter if we are in our homeland or been relocated. Being under an oppressive government shouldn’t stop us. Look at all those saints in China who for years grew in numbers, illegally and exponentially. If our job was done, we’d already be in Heaven. Jesus finished His work and is there now preparing a place for us. We still have work to do. We can only accomplish it be being so in love with LOVE (God is love) and going where His Spirit leads. 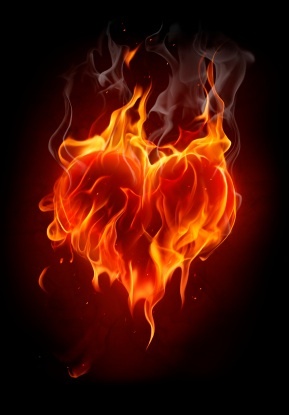 Doesn’t it all set your heart on fire!